We love this new billboard campaign for Petersburg, Kentucky-based Creation Museum, a "70,000 square foot museum brings the pages of the Bible to life." This particular campaign appears to promote the museum's Dinosaur Den. Interestingly, and unlike many other museums, the Creation Museum touts the idea of natural selection versus evolution and downplays the "molecules-to-man" line of Darwinian thinking. Or at least that's how we interpret it. The billboard campaign itself is perfect. 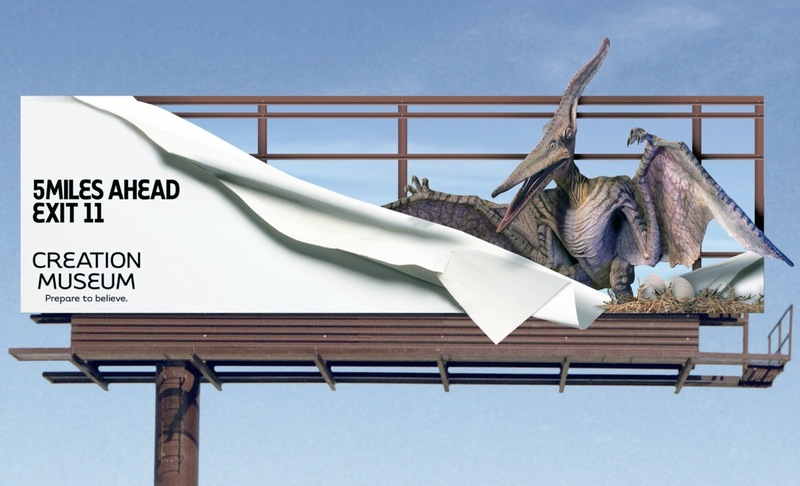 After all, what do you think a dinosaur would do if a billboard got in its way?